This video was sent to UFO.whipnet.org by Josh Ruckstuhl. 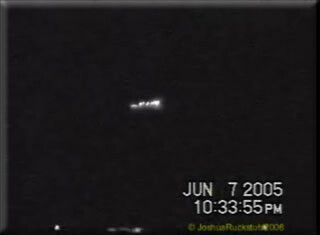 The UFO lights were filmed on the evening of June 7th, 2005 on the outskirts of Phoenix, Arizona. You can see several flashes in different locations that last for several seconds apiece, and then what appears to be a string of many lights that flash in a pattern. Similar to the events that happened in March 1997 called the "Phoenix Lights"
Even though the film is little grainy and low quality, it's not bad and does have a point-of-reference. If you didn't know any better, you'd think it was anti-aircraft flak, but it's over Phoenix.